Monday Musings: Happy Birthday to Us!! 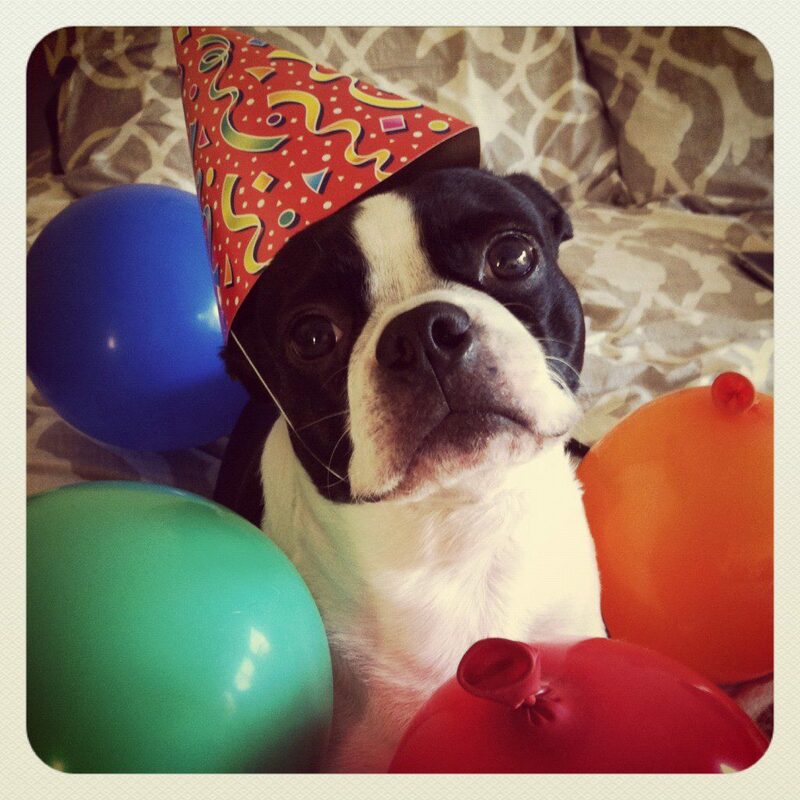 It’s our Birthday here at the RS Vacations Blog. One year ago, we began this blog to share with you all of the wonderful things Big Bear Lake has to offer. Each week we spotlight our homes, I muse about memories, we keep you up to date on things to do, you get special deals on homes and packages, find out about the weather and events, learn a fun-fact, and even pick up a recipe or two. We would like to thank all of our readers for supporting our blog, our home owners for trusting us with your homes and our guests for letting us find you the perfect cabin for your mountain getaway. 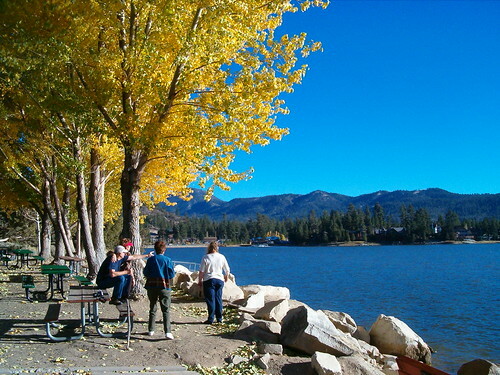 We look forward to the coming year in beautiful Big Bear Lake! Keep reading and visit us at RSVacations.net!! Willkommen to Bär Wiesen Stadthaus… Welcome to Bear Meadows Townhouse. Get away from it all and enjoy a relaxing Big Bear Retreat – any season of the year – at beautiful Bär Wiesen. This 2 Bedroom, 2 1/2 Bath Townhouse is located in the Moonridge area of Big Bear Lake – on the Golf Course and is walking distance to Bear Mountain Ski Resort and the Big Bear Alpine Zoo. The Lake and Village are just minutes away. It is situated among the pines in a beautiful, quiet complex. As you enter Bear Meadows, you will enjoy vaulted, beamed ceilings and large windows with lots of light and fabulous Golf Course Views. The Living Room features a lovely, brick Fireplace, Ceiling Fan and HUGE Flat Screen TV and DVD. There is plenty of comfortable seating, including a Queen Sleeper Sofa. The perfect place to kick back after a day on the slopes, the golf course or the lake. There is a Half Bath on this main floor for your convenience. The comfortable Dining area also has a pretty view of the Golf Course and has a slider to the Large Deck which has a BBQ and Table/Chairs to enjoy the fresh mountain air. In the super-clean Kitchen, you will find tile counters, wood floors, lots of cabinets and everything that you need for your stay. Venture upstairs to find 2 comfortable Bedrooms. Master 1 features a luxurious, King Bed, ceiling fan and Flat Screen TV. There is also a good sized closet and a Private Full Bath. The second Bedroom has 2 Twin Beds, ceiling fan, Flat Screen TV and also has a Private Full Bath. A full-size Washer and Dryer are located on the 2nd floor as well. Bear Meadows Townhouse is the ideal place to enjoy both recreation and relaxation in Big Bear – all 4 seasons of the year. Come on up!! Es ist Wunderbar!! – It’s Wonderful!! NOTE: Sorry, facilities at the complex (such as the tennis court) are for owners only. View more photos, check availability and book Bear Meadows Townhouse online at RSVacations.net today and treat yourself to a relaxing Big Bear Lake Vacation. Brrr!! Fall is in the air this week in Big Bear. Crisp mornings, sunny afternoons and chilly nights. That means sweaters, fires in the fireplace and snuggling under the covers! It’s gorgeous up here!! The Oktoberfest is going strong, the nightlife is Rocking with Live Music and there are several important events happening this weekend. The traveling Vietnam wall will be here, as well as a Fundraiser Gala for D.O.V.E.S. Check out the details on the flyer below. It looks to be a perfect weekend here in the mountains. RS Vacations has some cool deals for the cooler weather. We also offer several discount packages for things to do around town. Enjoy a Wine Tasting Flight at Le Dolce Vita Tasting Room, get a great deal on Mountain Bike Rentals, take o Horseback Ride through the forest or enjoy a relaxing In-Cabin Massage. We offer all of those and many more! Check out the deals and packages page here and then book your ideal Big Bear Cabin. You’ll be glad you did!! This discount applies to active Military as well. 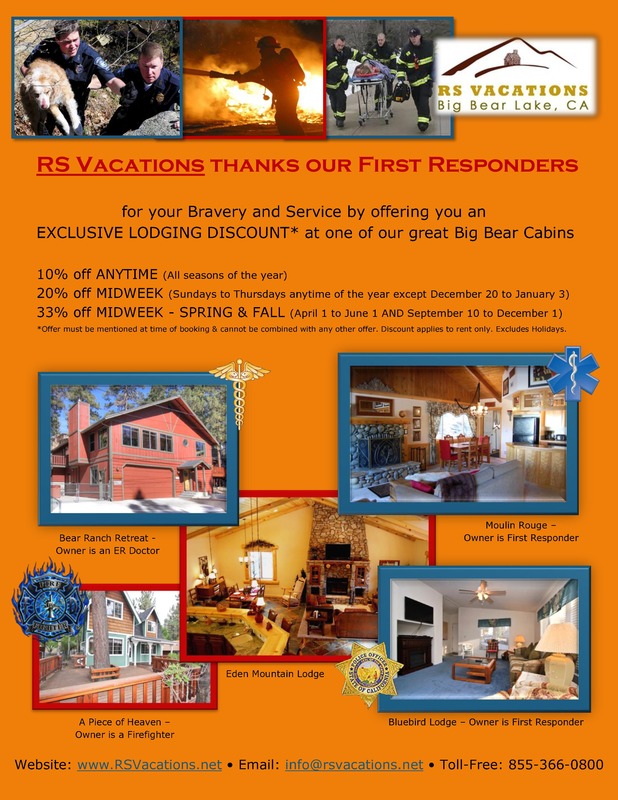 Visit RSVacations.net and book a Big Bear Cabin today! 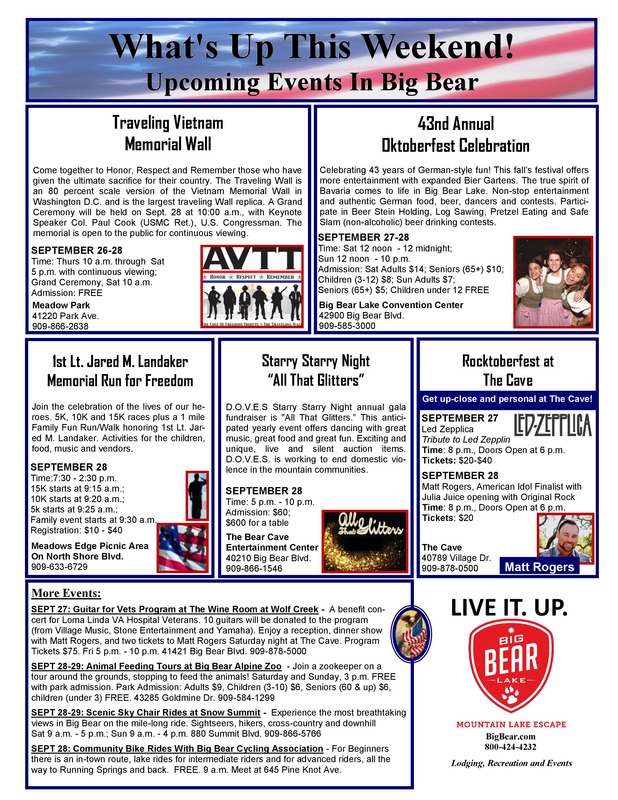 The Traveling Vietnam Wall will be visiting Big Bear Lake September 26-28, 2013. It will be located at Ski Beach at Meadow Park at 41220 Park Avenue, Big Bear Lake CA 92315. Thursday September 26th will be visitation day for the the students of Bear Valley Unified School District , Friday September 27th will be visitation day for active military from local base, General Public is invited on Saturday September 28th. Our Traveling Vietnam Memorial Wall is the largest traveling replica of the Vietnam Memorial Wall and is the center piece of our Cost of Freedom Tribute. It is an 80% replica with 100% of the names. The Traveling Wall is a great way to hold a Vietnam Welcome Home event in your community. It creates a great forum for communities to raise local awareness for its Vietnam veterans and the chance to host an event that can raise funds for Vietnam veterans and their causes in your local community. We are committed to helping our nation’s heroes, one community at a time. Through its various programs and tributes, AVTT is fostering the education and building the appreciation of our youth in the sacrifices made by countless men and women in defense of freedom and the way of life they enjoy. This coming weekend, Big Bear residents and visitors have a unique opportunity to remember and honor those who have given the ultimate sacrifice in defense of our country. My post tomorrow will have all the details. Today’s post is simply my thoughts and feelings about war and those who serve. I hate war. To me, it is a waste of precious lives. Fathers, Mothers, Sons, Daughters, Husbands, Wives….. I accept that it is sometimes necessary in the world we live in, in order to remove dangerous leaders who wish to wreck havoc on the world (ofttimes even their own people). I understand that it is sometimes required to establish Democracy in countries that don’t have it, but desperately want it. I agree that it is honorable in order to protect our Allies. I respect that war is how we gain and guarantee our freedom from tyranny and oppression. I just really wish there was another way to accomplish these things. 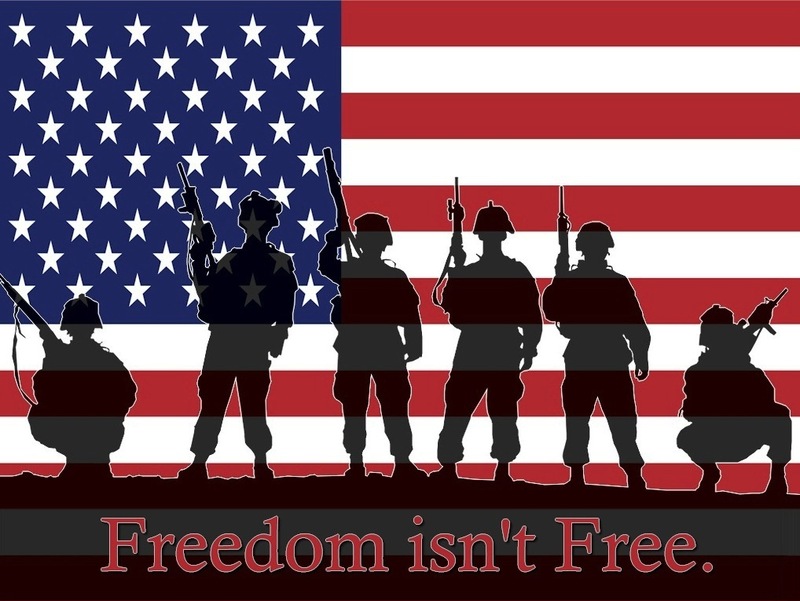 With that being said, I will always support our troops – whether I agree with the war or not. The boots on the ground, in the air and on the water have no hand in the making of war – that is done by people who are safe in their homes and offices. The troops simply do the job they are given to do, hoping that they get the chance to see their loved ones again. I am amazed by those who choose to serve and who are faced with dangerous leaders (and their forces) who wish to wreck havoc on the world, many times saving the very people of that country. I am impressed with those who serve and who help establish Democracy in countries that want it. I am proud that people choose to serve and protect our Allies. I am humbled that men and women from all walks of life are willing to die for my freedom from tyranny and oppression. RS Vacations Respects and Honors those who are serving and have served in the Armed Forces. To those that have come home – whole or not, and to those who gave their lives, Thank You. “OMG” Our Mountain Getaway is the perfect Big Bear Escape AND it is close to the Oktoberfest! Get away to the mountains and leave your cares behind at OMG. This beautiful 3 Bedroom, 2.5 Bath, 1730 sq.ft. home is everything you would want a mountain getaway to be. It is situated on a quiet, treed area next to the forest – close enough to town to enjoy everything Big Bear has to offer, but away from the traffic and noise. The perfect escape! Parking for 3 cars and a welcoming covered, front porch await you at your arrival. You enter in to OMG on the first floor where you can kick off your boots, hang up your coat and relax in front of the large, Flat Screen TV with DVD, or choose a board game to play at the convenient table located here. A half bath is also found on this level. You will enjoy the woodsy feel of this home with its wood-beamed ceilings and cabin decor throughout. Venture upstairs into the main, open Living Room which features a gorgeous, Brick Fireplace with gas insert, a large Flat Screen TV with surround & DVD and seating for everyone to be comfy. A Dining Table is located here as well, along with a door leading to the 2nd story Deck. The darling Kitchen has all the conveniences of home and is ready for you to create the perfect family meal. Sit at the rustic, wood bar and enjoy a stunning, forest view! Down the hall is Guest Room 1 with a comfy, Queen Bed and Flat Screen TV/DVD. A 3/4 Bath with large shower is right next door and a door to the big, back Deck for BBQing and enjoying the fresh, mountain air is here at the end of the hall. There is plenty of room for the kids to play in the snow in the large back yard. The 3rd floor is where you will find 2 more Bedrooms and another Bath. At the top of the stairs is a convenient Desk and Chair for surfing the internet or sending an email. The Master Bedroom has a beautiful, log, King Bed and a Flat Screen TV/DVD. The large, Bathroom next door features a luxurious, jetted tub. Guest Room 2 is the place for kids! Enjoy hours of fun with the Foosball Table, big, Flat Screen TV/DVD with PS2 system & Games and mini boom box. Tuck the kiddos in for the night in the cute, log Bunk Beds – there is even a selection of kids books for a bedtime story! This home truly is a wonderful place to relax and enjoy the serenity of Big Bear. Book today and have your own “OMG” escape! Let Our Mountain Getaway be Your Mountain Getaway. View more photos, check availability and book Our Mountain Getaway online at RSVacations.net today and treat yourself to a relaxing Big Bear Lake Vacation.